Much of the buzz for Saturday’s concerts by the Pasadena Symphony at Ambassador Auditorium surrounds David Lockington’s first concerts as the orchestra’s fifth music director. However, the soloist, violinist Anne Akiko Meyers, has quite a story to tell, as well. 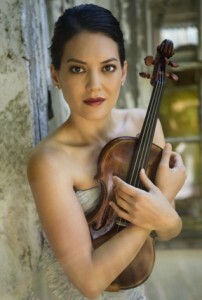 However, when she returns to open the PSO’s 86th season Saturday, she will be playing not her Strad but the “Ex-Vieuxtemps” Guarneri del Gesu, an instrument Myers calls “one of the most iconic violins ever made.” Earlier this year, Meyers received lifetime use of the “Vieuxtemps” for concerts and recitals thanks to an unnamed benefactor who purchased it at a Chicago auction. The “Vieuxtemps” received its recording debut with Meyers playing when she performed Vivaldi’s The Four Seasons, along with Arvo Part’s Passacaglia, accompanied by the English Chamber Orchestra, conducted by Lockington. The recording is scheduled to be released next Valentine’s Day. Meyers has not decided what to do with her two Stradivarius violins. “As I was given lifetime loan of one of the most important violins ever created,” she said in an email, “I am playing on the “Ex-Vieuxtemps” almost exclusively now. I am deciding what to do with the “Royal Spanish” Strad and the “Ex-Molitor/Napoleon” Strad.” Given her statement earlier about instruments in museum cases, one might expect that the two Strads will find their way to other musicians. Saturday’s concerts mark the second consecutive “debut” concert for Meyers with the PSO; when she appeared in 2010, it was James DePreist’s first concert as the orchestra’s music advisor. For Meyers, Southern California concerts count as homecoming. Her career began in Southern California (Meyers was born in San Diego). Now age 43, living in Austin, Texas, where she is Distinguished Artist and Professor of Violin at the University of Texas’ Butler School of Music and the mother of a two daughters, Meyers was living with her parents in Ridgecrest at the age of seven when her mother drove her more than three hours each way to Pasadena so Meyers could study with famed teacher Alice Schoenfeld at The Colburn School. Meyers’ rise in the musical world was meteoric. She appeared twice on “The Tonight Show” with Johnny Carson at age 11, made her Los Angeles Philharmonic debut the same year and a year later soloed with Zubin Mehta and the New York Philharmonic. At age 23, she was awarded the prestigious Avery Fisher Career Grant, the only artist to be the sole recipient of this annual prize, and embarked on an extensive recording career with RCA Red Seal (at the time one of the most prestigious labels in the industry). • You can see a YouTube video clip of Myers talking about the violin HERE and that same clip is currently the lead when you click on her Web site HERE. • Information on Saturday’s Pasadena Symphony concerts is HERE. (c) Copyright 2013, Robert D. Thomas. All rights reserved. Portions may be quoted with attribution. This entry was posted in Uncategorized and tagged "Ex-Vieuxtemps, Ambassador Auditorium, Anne Akikko Myers, David Lockington, Pasadena Symphony by Robert D. Thomas. Bookmark the permalink. The violin is reported to be in fantastic condition, with no patching work in any way. Yes, it’s great this violin is going to be played again, but I am puzzled with the operator’s decision. Violins and cellos are worn out as time continues, they are more vulnerable to accidents, and playing doesn’t make them sound far better.